Also available is our “Air Flow Regulators” which mount behind the Vent Covers to enable you to control (increase or decrease) heating and cooling efficiency. These Regulators mount independently of the Vent Cover and operate with a key, but in some cases you may need to remove cover. We carry decorative grills in black cast iron, bright brass, as well as real wood. Registers have venting flaps to regulate air flow. 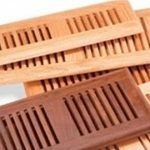 Grilles provide only a decorative finish.